On March 5, seawater made streets impassable in this Oceanside Drive neighborhood in Scituate during high tide. Real estate broker Jim McGue expects to soon list for sale a home off Quincy Shore Drive, a location whose top selling point would normally be its front-row water views. But the low-lying street also took the brunt of a number of recent nor’easters, and McGue said the owners told him their backyard was inundated during one storm in March — the worst flooding in their 25 years there. The roads are dry now, and all along Massachusetts’ coastline cleanups are mostly complete. But as the spring real estate season blooms, the memory of the storms hangs over waterfront and water-view properties that otherwise would command premium prices. With rates for flood insurance already sky-high, and concern about global warming and rising sea levels more widespread, some prospective buyers are weighing whether it’s worth it to live at the ocean’s edge, real estate agents say. Homes along or near the waterfront in Revere, for instance, aren’t selling as fast this season as they did last year, said Maureen Celata, owner/broker at M. Celata Real Estate in Revere. And unlike many homes elsewhere in the Boston area, some Revere properties near the water are not selling over asking price, she said. A home in the Point of Pines neighborhood that included a “private beach” sold for about 9 percent below its $799,000 asking price, Celata said, and took 55 days to sell. That’s an eternity in the region’s superheated real estate market, where a longstanding drought of available properties has sparked fierce competition among buyers. That’s not to say the images of flooded backyards and basements have caused waterfront properties to completely lose their cachet among buyers who can afford the risk that comes with multimillion-dollar views. One of Quincy’s highest-priced properties, for instance, is on Sea Avenue. It’s listed at $985,000, or about $641 per square foot, compared to a citywide average of $339 per square foot, said Constantine Valhouli, research director at NeighborhoodX, a website that tracks real estate values. In Gloucester, the highest-priced units on a per-square-foot basis are also along the waterfront: 1,042 on Atlantic Road, and $1,039 on Mussell Point Road. That’s about three times Gloucester’s per-square-foot average of $333. A shot from March 5 shows the kind of damage flooding from a big storm can do. 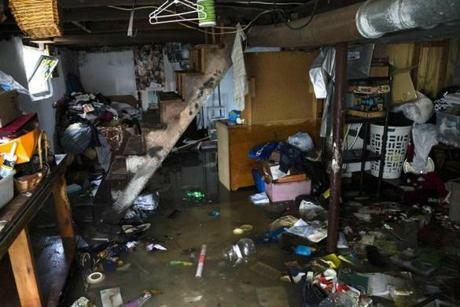 This is the basement of a home in Quincy. It’s the same story in Scituate, which consistently bears the brunt of coastal storms. And in parts of Boston hit hardest by winter storm surges and tidal flooding — such as the Seaport and East Boston — the real estate market is still focused on luxury living, not rising sea levels, Valhouli said. 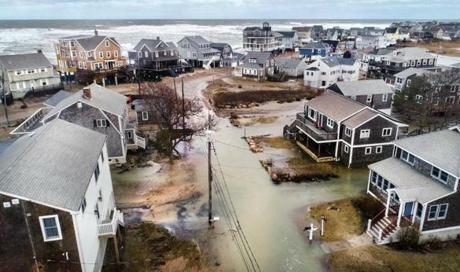 A recent analysis by the Union of Concerned Scientists, a Cambridge science and environmental advocacy group, pinpoints several Massachusetts coastal areas that now flood 26 times or more annually—not only due to storms, but as a result of higher tides reaching farther inland. They include parts of Marshfield, Scituate, Cohasset, Quincy, Revere, Lynn, Winthrop, and large swaths from Ipswich to Salisbury. In Boston, parts of South Boston, East Boston, the Seaport, the North End, downtown, and Charlestown are in the scientists’ frequent-flood zone. The group’s interactive map includes scenarios for how much more frequently floods will occur and how much farther they will extend by 2035, and all the way to 2100, when it’s projected the seas could rise by about four feet globally. Policy makers regionwide have begun working on plans to address the effects of climate change, including rising sea levels. But so far, worrying about flooding is not automatically a factor for buyers looking at homes in coastal neighborhoods. Aaron Terrazas, senior economist for the real estate website Zillow, said shoppers are too stressed about the lack of reasonably priced properties to worry much about rising sea levels. Still, buyers should make it a point to ask whether a property was affected by the recent nor’easters, said real estate attorney Richard Vetstein. In Massachusetts, sellers have no legal duty to disclose damage unless they are asked directly, he said. Agents and brokers, on the other hand, are legally required to voluntarily disclose any issues that may influence the buyer not to enter into an agreement. “Evidence of recent flooding should be pretty apparent,” Vetstein said. Sellers with lower flood insurance rates have a better chance at selling their homes for asking price because they can transfer those policies to the new owners, said Rick Stoeckel, an agent with Tonry Insurance Group in Quincy. “The problem is people who weren’t locked in to a low rate end up having to sell the house at a reduced amount if they’re in a flood zone,” Stoeckel said. He had clients last year with low flood insurance rates who sold their half of a side-by-side duplex on Quincy Shore Drive for $30,000 more than the other half, which didn’t have flood insurance. New flood policies along Quincy Shore Dr. can reach close to $3,000 a year, Stoeckel said; he pays $1,600 in flood insurance for his Quincy Shore Drive home, while his neighbor pays nearly $2,800. The shortage of properties for sale means people are still willing to buy in flood zones, said McGue, the Quincy broker — if the insurance rates are reasonable.